In Japan an ancient board game is displacing Nintendo and making kids think their grandfathers are cool. In recent years, the ancient game of go had reached a dead halt in Japan. Its avid players were ageing and their numbers dwindling (from an estimated 8 million to 5 million during the 1990s). Then, four years ago, out came the serialized comic "Hikaru no Go" ("Hikaru's Go"), about a bleached-blond boy who becomes a professional go player aided by the spirit of a long- deceased master. Now, black and white go pieces are rapidly supplanting Pokemon cards in the restless hands of children across the country. Parents couldn't be happier. They credit the game with improving their children's manners, distracting them from videogames and cell phones, and bridging the generation gap. "You know something? My grandpa is really good at playing go like a pro. He is so cool," said 9-year-old Asahi Sakamoto, one of 200 children who turned out for junior Go classes one recent weekend at Tokyo's Japan Go Association. Hisako Shimohata, 12, says she's been hooked since last fall. "The game of go is more futuristic than TV games," she explained. "Unlike electronic games, you sit and face your opponent. You communicate with words and try to read each other's minds." "Futuristic" is probably the last word most people would associate with go. Developed some 4,000 years ago in China, it crossed into Japan around the 8th century and became popular with the warrior classes. From there, it spread to all levels of Japanese society. Played on a wooden board using smooth black and white stones, the objective is fairly simple: to use your game pieces, and wits, to compete for territory. In recent years go had been largely a pastime of the elderly. Then, in 1998, the popular comic weekly Shonen Jump began running "Hikaru no Go." It tells the story of Hikaru, a happy-go-lucky boy who finds an old go board with a spirit living inside. Fujiwara no Sai, a go master who lived during the Heian period (794 to 1192), had been looking for another chance to play the game using the mind of a boy like Hikaru. Though the two characters live centuries apart, they hit it off and Sai's sage advice helps vault Hikaru into the professional leagues. In 1999 the story was turned into a series of comic books that have sold more than 16 million copies. And, last fall, a Japanese network launched an animated TV show based on the comics. 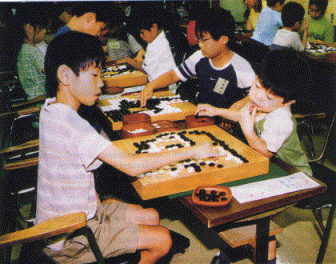 "'Hikaru no Go' is a godsend," says Tadao Sakamaki of the Japan Go Association. "The number of children wanting to study go is expanding so rapidly that we don't even know how many of them there are in Japan!" Hundreds of go classes are sprouting across the country, and schools are beginning to teach it as well. Because it appears in the comics, the Japan Go Association has even become a destination for school trips, akin to Disneyland and the national Diet building. Students can come inside and see the room where Hikaru plays. "It's a great way for them to learn Japan's history and culture says Tsuyoshi Kurashina, 56, an elementary-school teacher from northern Hotaka town, who recently brought his 31 students to the Go Association. The trend comes at a time when Japanese parents have been increasingly concerned about the ill effects of videogames. A study reported just last week in the newspaper Mainichi Shimbun showed that extended videogame use can cause irritability, loss of concentration and antisocial behaviour. "My 8-year-old son is learning how to use his brain, thanks to 'Hikaru no Go'," said Yuki Nagata, 35, of Tokyo. "He is also learning to be patient with his opponent." Many also hope go can help improve what many perceive to be a decline in good manners across Japan. In June, Japan's biggest daily, the Yomiuri Shimbun, published a survey that found that 90 percent of respondents believed the manners and behaviour of Japanese people had worsened; 60 percent said the problem was especially bad among young women and middle- and high-school students. "The game of go teaches children how to behave," says Atsushi Katsura, 24, a go teacher from Tokyo. He believes the game's complex rituals instill good sportsmanship and a respect for one's opponent. If that's the case, then much of Asia could be in for a manner adjustment. The "Hikaru no Go" books are now sold in Singapore, Thailand, South Korea, Hong Kong and Taiwan. The animated series just went on the air in Taiwan and will make its debut Southeast Asia. Grandparents: unlock your game chests. From "News Week", July 22-29, 2002.
will also give you lots of hits. As with everything on the web - be selective. Much of what you find will be rubbish.